A fine example of Rigobert Bonne and Guilleme Raynal's 1780 map of the Reunion (Ile. Bourbon), Mauritius (Ile. de France), and Rodrigues Islands, collectively known as the Mascarene Islands. Essentially four maps in one, the first map shows Reunion (Bourbon) Island. This map includes inland mountain ranges, featuring an erupting volcano in profile, and a detailed coastline with cities, rivers and ports. The center-most map details Mauritius Island (Ile. de France). Shows major cities and rivers and a detailed coast-line, including reefs, shoals, and other underwater dangers. 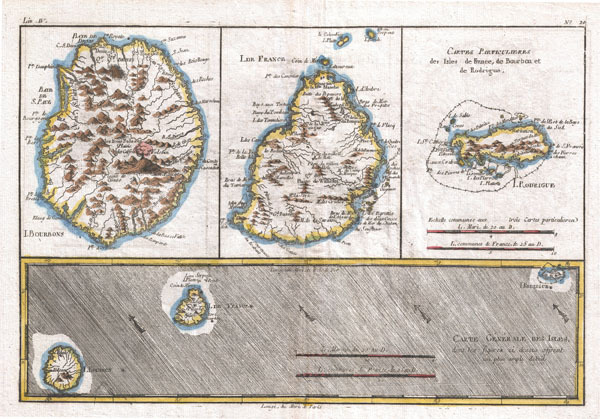 The third map focuses on Rodrigues Island (Rodrigue Island.) Features mountain ranges, cities, and the barrier reef surrounding the island. Drawn by R. Bonne for G. Raynal's Atlas de Toutes les Parties Connues du Globe Terrestre, Dressé pour l'Histoire Philosophique et Politique des Établissemens et du Commerce des Européens dans les Deux Indes.